A California native and accomplished professional artist and designer, Roger Hector has spent over 25 years creating and designing his passions. His life-long fascination with automobiles started as a young man building models ... then real cars. After winning a national auto design competition, he attracted the attention of General Motors, who suggested he pursue a career in automobile design. They then offered him a scholarship at the prestigious Art Center College of Design, where he graduated with Honors. In his design career, Roger has created a great variety of products from computer games, to driving and flying simulators, to theme park attractions for major corporations including Walt Disney, Sega, Atari, Bally, Electronic Arts and Universal Studios. He holds over a dozen technology and design patents, but his passion for cars has always been a central core of his artistic inspiration and enthusiasm. His highly accurate, detailed, and tightly controlled art style is a hallmark of his work. He enjoys mixing and experimenting with different media, and seeks to create emotional connections through the use of intriguing reflections, dramatic light sources, and bold color. His extensive understanding of form and architecture, and his obsessively accurate attention to detail, has led him to create both classic portraits, and acclaimed fine art compositions. His work is highly sought by private collectors, and has been featured in major museums such as the National Automobile Museum in Reno, Nevada, and the prestigious Blackhawk Automobile Museum in Danville, California. 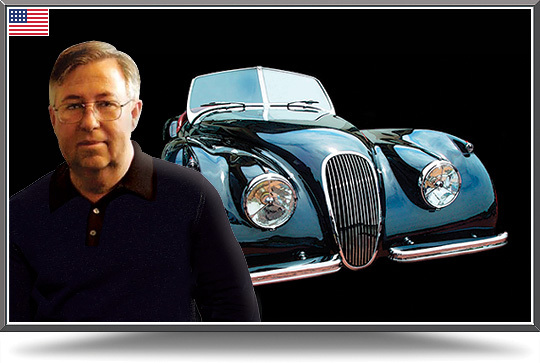 He has been featured in west coast fine art galleries, and has worked extensively with commission work for fine art and automobile collectors and owners. Commission Roger to create a unique painting for you!